We found a 1900 article from the Eastport Sentinel in our files the other day describing a confrontation between a streetcar and a horse on Hinckley Hill. The winner was – well, you know the answer already, and we’ll provide details later – but it set us to feeling sorry for all those packhorses, draught horses and nags who did much of the real work around here for nearly a century. How could they know they were on the road to obsolescence and far sooner than anyone could imagine? William Pike brought the first horse to Calais in 1806 and a hundred years later the horse remained a prized possession of many families and an indispensable asset to the working man. For a farmer it was more important to have a good vet on call than to live next door to a doctor. 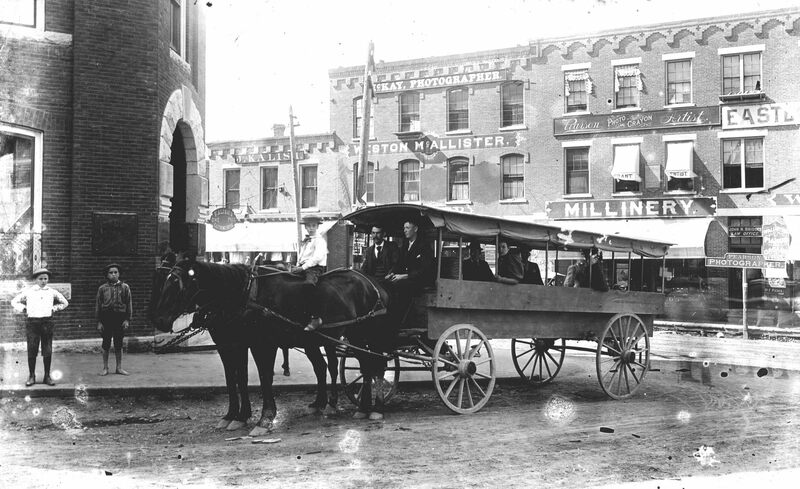 Even the Milltown to Calais’ taxi in the 1800’s, show here at bank corner at Main and North streets, was two horse power. The centuries-old reign of the horse was in danger even before 1900 and the first automobiles. 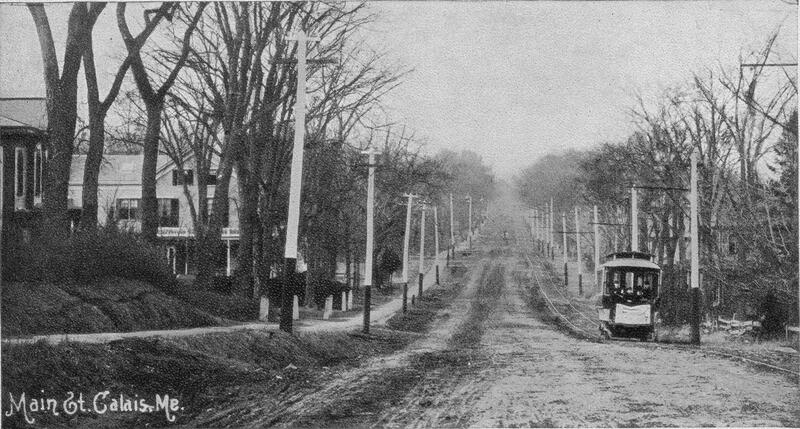 The streetcar began operating in Calais in 1894. The trolley, as it was called, is seen above on its way up Hinckley Hill on the way to Steamboat Street and the lower wharf. It became possible for folks to get nearly anywhere in the four towns for a nickel without the bother of harnessing the horse and cajoling it to move with the promise of a bag of oats. The oats were pricey and went in one end and out the other at the most inconvenient times and places. The streetcar was clean, cheap and could be a very pleasant social experience. A brief but exciting runaway occurred on Hinckley hill, Monday afternoon, and while at one time things looked rather black for the parties in the carriage all escaped without a scratch and the horse and carriage were uninjured. L. H. Newcomb, an Eastport attorney, was driving down town with a companion. Mr. Newcomb was leading a horse and his companion was driving. Going over Hinckley hill a street car was met, and the horse which was hitched to the carriage became frightened and ran up the bank at the roadside upsetting the carriage and throwing the occupants out. The lead horse gave a jerk and landed Newcomb on his back in the mud, and the animal which caused the trouble bolted down the hill with the driver hanging pluckily to the reins. When matters were adjusted it was found that neither men, horses nor carriage had been injured in the least. There were other incidents involving streetcars and horses, some serious. In one typical incident from 1908 a cow grazing along the streetcar track near the brickyard on North Street was frightened by the trolley and ran into William Kennedy’s horse. The horse bolted and threw Kennedy under the wheels of a cart. He was seriously injured. One cause of social and economic change during this period in Calais, as elsewhere, was the invention of the automobile. Mr. William Alexander and Mr. Charles Phinney were two of the earliest dealers in cars in the year 1906. ‘One of the first models to appear on our streets was the Rambler owned by the late Dr. Charles Murphy. He and his wife, Mrs. Frances Wilder Murphy, had one unhappy experience with this car while making a trip to St. John, N. B. in 1901. Equipped with a chain drive, it proved very inefficient on the gravel roads. At Lepreau, it was necessary to stop over for several days for repairs, after which they proceeded to St. John. Here, they decided to go for a ride and met with another unpleasant experience. An old gentleman driving a horse and buggy, was thrown from his vehicle when his horse became frightened as the Rambler passed, causing him to break his arm. Finally, the conscientious doctor became so disgusted with his auto that he shipped it home by freight car while he and Mrs. Murphy returned to Calais by train. This invention has changed our community as it has others. According to Belmore’s history Princeton’s horses also had to adjust to the motor although they soon became accustomed to them. 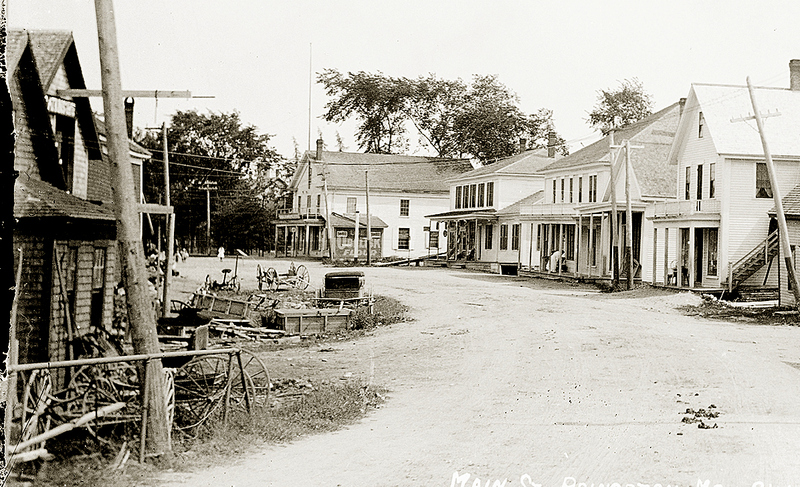 The year 1899 marks the date of the first automobile to be owned in town. 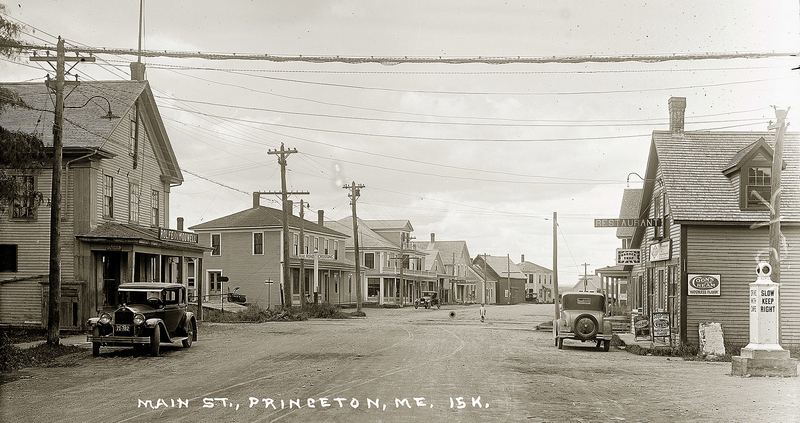 David Dresser, junior, that year bought an “Oriental Buckboard.” There was nothing much of the oriental or exotic in this unsightly contraption, for horse-drawn buckboards were no novelty in Princeton at the time. David’s new car was an elongated buckboard with an engine behind the driver’s seat instead of a horse in front of it. When and if it went, it created a terrifying racket. One day David took his mother out for a pleasure ride up Main Street; the darn thing ran off the road and bumped into the big juniper tree. On another occasion Charlie James was driving up town in the vicinity of Porter’s Stream when the Oriental hove in sight. Charlie’s horse was so badly frightened that he leaped off the bridge taking along with him the wagon and Charlie and all. Horses since then have become sophisticated and blase. When on the ground, they ignore automobiles completely; when aboard and going at the rate of sixty miles or better, they gaze lazily out upon the passing world with a distinctly bored look. It is different with dogs; they love cars and show that they do. 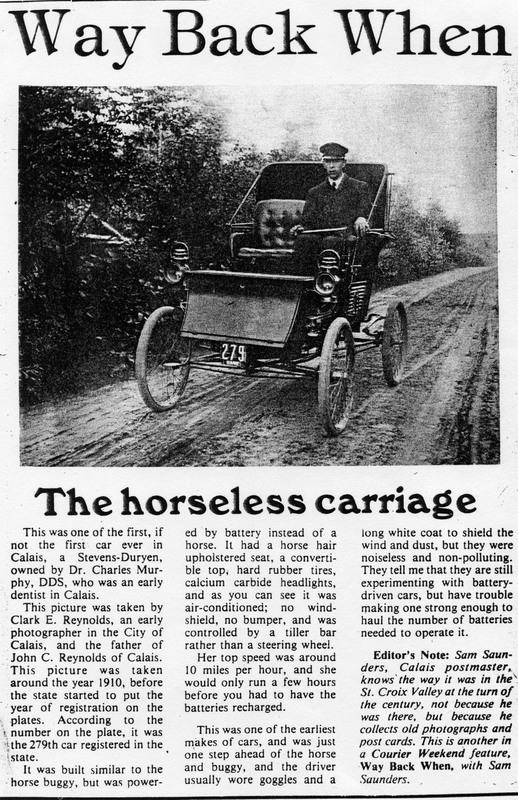 In 1904 Dr. Charles Spooner was living in Calais; he had the third car to be owned there, a Steamer. The second photo is very interesting. Look carefully to the left and you will see a carriage and buggy graveyard. 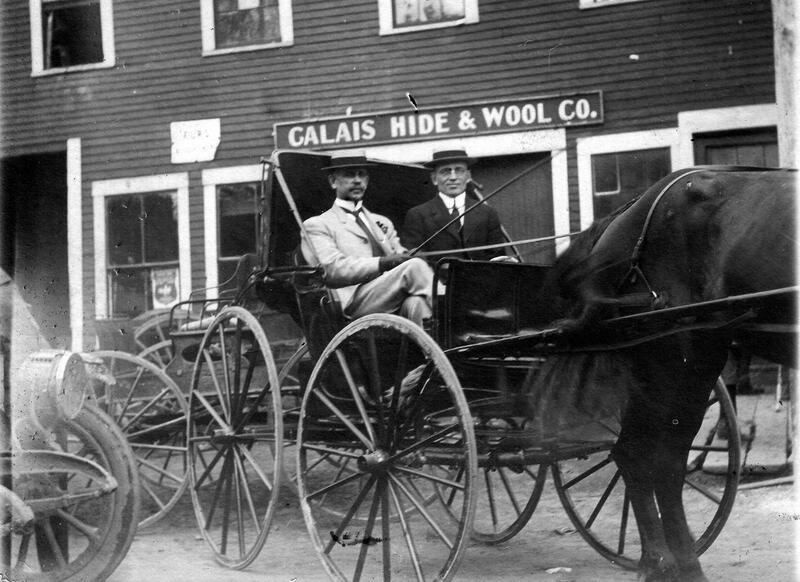 The first automobile (car) in Calais was a 1903 Stevens-Duyea owned by Curren. 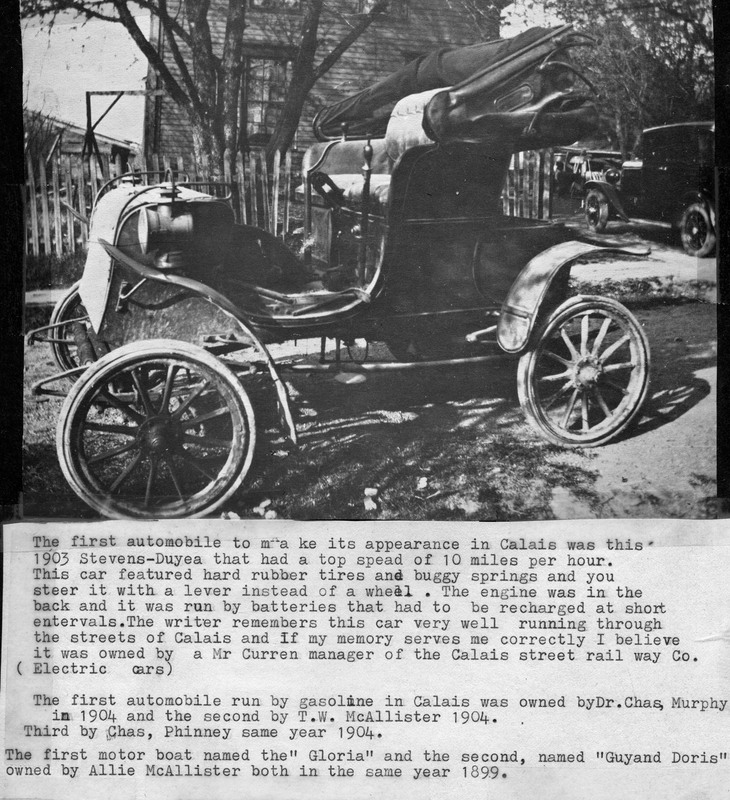 The first gas auto was owned by Charles Murphy in 1904 and the second by McAllister. The first automobile show was held in New York’s Madison Square Garden on November 3, 1900. Of the 40 different makes exhibited, only the Rambler is still in existence, outlasting such formidable competitors as the Autocar, Packard, Knox, and the Gasomobile. All across the nation, the well-to-do sported gas buggies ranging from imported Benzes and Puegeots to makeshift “blacksmith cars” put together in the back of dingy shops. By 1900, most Americans had seen a motor car although few had ridden in one, The clergy was very much against the automobile and many sermons were preached condemning the “devil wagons”. American farmers (about half the population) especially hated the chicken killing, horse-scaring, woman-frightening autos, plus they resented the fact that the contraptions didn’t consume oats or hay. The new plaything of the idle rich was also a real danger to cyclists and pedestrians, who had always considered the public highways (such as they were) as their own. If electric car technology had bested the internal combustion engine in the early 1900’s it wouldn’t have helped the horse a whit. The era of the horse was over but perhaps the noble horse would have faded into history more gently, listening to the purr of the electric motor rather than the explosions of the internal combustion engine.